Alepo and Altai, two leading Wi-Fi technology providers, recently cemented their ongoing partnership with the release of a joint solution for ready-to-launch carrier Wi-Fi networks. 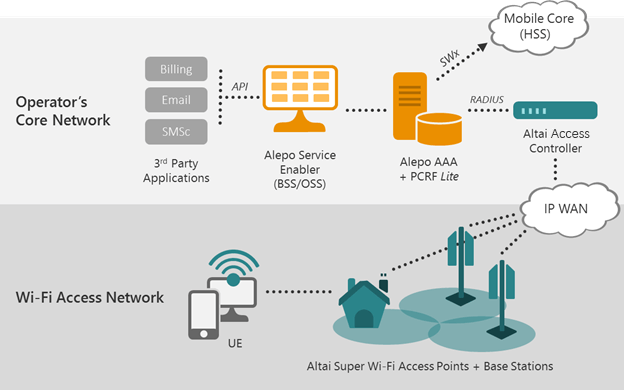 Thursday, October 15, 2015, Dubai, UAE; Austin, TX; Hong Kong – Ahead of GITEX 2015, Alepo (www.alepo.com) and Altai (www.altaitechnologies.com), announced today the release of a joint solution for carrier Wi-Fi networks, responding to the growing demand in the telecommunications industry for ready-to-launch Wi-Fi network infrastructure that can lower deployment time and costs without the sacrifice of carrier-class high performance, security, and scalability. The joint solution pairs Altai’s Super Wi-Fi base stations and access points with Alepo’s complete Wi-Fi monetization and Wi-Fi offload software platforms. When deployed together, the Alepo and Altai products afford significant cost-saving benefits, including a ready and rapid deployment, proven interoperability, and ease of daily operations. In addition, the solution enables carriers to bring more competitive Wi-Fi offers to market quickly in order generate revenue from the investment. Gross noted that the solution readily enables diverse Wi-Fi business models, including subscriptions and casual use, advertising and location-based offers, reseller and affiliate models, international roaming, and many other emerging Wi-Fi business models today. The announcement of this solution follows multiple joint Wi-Fi projects in 2015, including the launch of Wi-Fi services for UhuruOne in Tanzania and a large ISP in South Asia (unnamed). Alepo and Altai also provided the complete Wi-Fi experience for participants at Andicom 2015 in Cartagena, Colombia earlier this year. Executive leadership from Altai and Alepo will be available at the upcoming GITEX 2015 industry event to discuss their carrier Wi-Fi solution offerings. GITEX 2015, October 18 – 22, 2015 at the Dubai World Trade Centre in Dubai, UAE. To schedule a time to meet with either or both companies, please visit www.alepo.com/upcoming-events. In the GITEX 2015 exhibition hall, Alepo will be located at stand Z-M47 within the Indian pavilion. Altai will be located at stand SR-N6 in the Hong Kong pavilion. For more information about GITEX 2015, please visit www.gitex.com. Altai Technologies is a leading supplier of carrier-grade WiFi products and technologies with deployments in 100 countries. It is also the leading solution for the vertical industrial markets, covering over 180 terminal ports and airports globally. The Altai Super WiFi Solution includes a complete portfolio of indoor and outdoor products for carriers, WISPs, and enterprises to support a wide range of applications such as mobile data offload, public access, WLAN access, and backhaul. For more information, please visit www.altaitechnologies.com.